Can anyone recommend a Masto client for Android that supports filters? (Or point me to where I can apply them in Tusky.) Boosts okay. TIA. Das ist ein Alarmsignal für die Demokratie! Nach #Attac droht nun #Campact der Entzug der Gemeinnützigkeit. 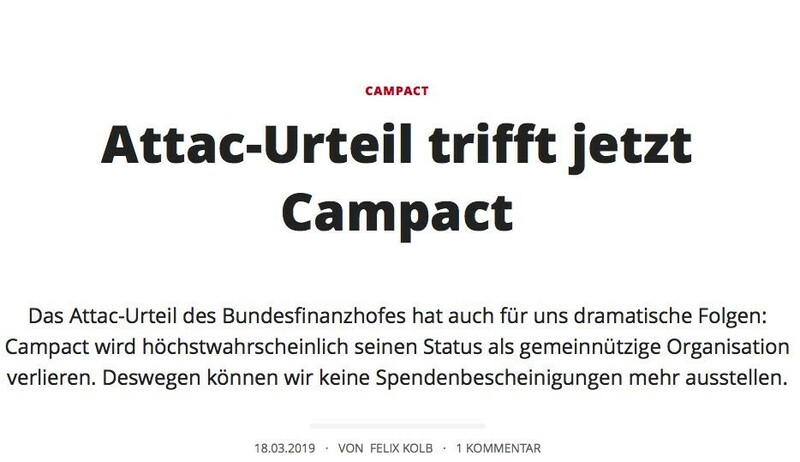 #Campact stellt nun keine Spendenquittungen mehr aus. Das zeigt: Das #Attac-Urteil löst einen Dominoeffekt gegen die Zivilgesellschaft aus. NGOs brauchen Rechtssicherheit! John Battelle: "By declaring “private conversations” as its new business model, Facebook can undermine the app store model driving all of mobile, unseat Amazon as the king of e-commerce, hollow out Google’s control of search, nip Apple’s transition to services in the bud, take a vig on every transaction across its ecosystem, and insinuate itself into the […] lives of every citizen"
If you post an article even remotely date-sensitive, please include the publication date somewhere in or around the article. In fact, add the date even if it doesn’t seem relevant, because it is always relevant. #Erfurt erwartet am 1. Mai eine Horde von 10.000 #Nazis. I went to the library and asked for a book on Pavlov’s dog and Schrodinger’s cat. The librarian said it rang a bell but she didn’t know if it was there or not. Schönes Interview mit meinem Freund und Geschäftsführer Fabian von RECUP bei freemindedfolks. Dufter Typ, ganz ehrlich. Set aside time for a hobby. Gardening, drone building, knitting, do something for the pure pleasure of it.